Points Nécessaires : 7950 Software is not compatible with mobile and tablet devices. Please add this title to your Wish List and sign on to your the first club account from a desktop computer to complete your redemption. ABOUT THE SOFTWARECrayola® Creative Studio - Four Great Programs in One for Ultimate Creativity!Crayola® Creative Studio is a multi-purpose graphic arts program combining the features of four Crayola art software titles in one program plus the addition of some advanced digital art tools and features. Users can draw, paint, animate, photo-edit, and apply special effects. Choose from - Art Start, … Art Studio, Animation Studio, or Photo FX Studio program levels to learn digital art technique or used the combined features at the Creative Studio level for an optimal digital creativity experience. KEY FEATURES Twelve realistic art tools simulating real art media for touch and pressure-sensitive drawing and enabled for touch screens Hundreds of pre-set colors or mix unique colors on digital palettes Hundreds of art images, backgrounds, and templates to create digital art, animations and much more! Import any standard digital file Export in standard file formats for use in other programs Learn digital art, photo-editing, and animation technique with an extensive collection of fun activities in the Activity Guide Quickly learn the program features with animated Program ToursSYSTEM REQUIREMENTS Children learn digital art, animation, and computer skills. 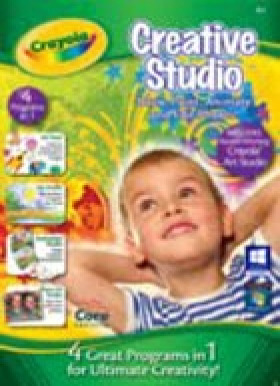 The program includes the features of the award-winning Crayola® Art Studio. OS:Windows 8, 7, Windows Vista, and XP.